Update September 2012: Buddha's Belly Thousand Oaks has closed its doors. Update 10/10/11: Buddha’s Belly Restaurant will open today, Monday, October 10, 2011 at 11:00am at The Oaks Shopping Center in Thousand Oaks. With existing locations in Santa Monica and West Los Angeles, the restaurant group has selected the Conejo Valley as its third Southern California location. Buddha’s Belly will offer freshly prepared Pan-Asian cuisine along with a delicious cocktail menu created by famed mixologist Vincenzo Marianella. 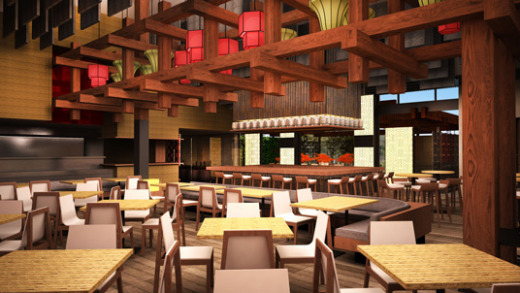 This location will feature a newly added sushi menu as well as signature dishes from Chef Hisashi Yoshiara. In addition to the comfortable and spacious dining room, guests can enjoy the outdoor patio, and private dining room. Convenient take-away parking directly in front of the restaurant will also be available late October. The restaurant will be located on the northeast side of The Oaks Shopping Center facing Hillcrest Drive. Buddha's Belly is committed to deliver good food and good fortune to our patrons, co-workers, and community. Buddha’s Belly CEO Jonathan Chu made his vision a reality nine years ago, creating a unique restaurant that would provide an eclectic selection of his favorite Pan-Asian foods at affordable prices that would woo both fans of Asian cuisine and the uninitiated alike. Inside the Feng Shui-designed restaurants, guests can enjoy a "culinary trip across Asia", a full take-out menu, and off and on-premise catering. After a 6 month wait, Buddha's Belly is finally opening its doors at The Oaks mall on Monday, October 10th. Located adjacent the The Cheesecake Factory where Sisley used to be. Buddha's Belly serves pan-asian cuisine, sushi and more. And of course there's still a cool outdoor seating area. Call 805.557.1212 or visit www.bbfood.com for more information.